The National Archives and Records Administration (NARA) is an independent agency of the United States government charged with the preservation and documentation of government and historical records. It is also tasked with increasing public access to those documents which make up the National Archive. NARA is officially responsible for maintaining and publishing the legally authentic and authoritative copies of acts of Congress, presidential directives, and federal regulations. The NARA also transmits votes of the Electoral College to Congress. Independent agencies of the United States federal government are agencies that exist outside the federal executive departments and the Executive Office of the President. In a more narrow sense, the term may also be used to describe agencies that, while constitutionally part of the executive branch, are independent of presidential control, usually because the president's power to dismiss the agency head or a member is limited. The Office of the Federal Register publishes the Federal Register , Code of Federal Regulations , and United States Statutes at Large , among others. It also administers the Electoral College. The Office of the Federal Register is an office of the United States government within the National Archives and Records Administration. Originally, each branch and agency of the U.S. government was responsible for maintaining its own documents, which often resulted in the loss and destruction of records. 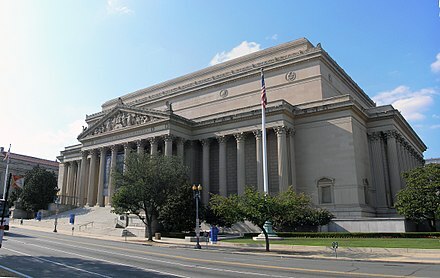 Congress created the National Archives Establishment in 1934 to centralize federal record keeping, with the Archivist of the United States serving as chief administrator. R.D.W. Connor was chosen to be the first leader of the organization. In March 2006, it was revealed by the Archivist of the United States in a public hearing that a memorandum of understanding between NARA and various government agencies existed to "reclassify", i.e., withdraw from public access, certain documents in the name of national security, and to do so in a manner such that researchers would not be likely to discover the process (the U.S. reclassification program). An audit indicated that more than one third withdrawn since 1999 did not contain sensitive information. The program was originally scheduled to end in 2007. In 2010, Executive Order 13526 created the National Declassification Center  to coordinate declassification practices across agencies, provide secure document services to other agencies, and review records in NARA custody for declassification. Most records at NARA are in the public domain, as works of the federal government are excluded from copyright protection. However, records from other sources may still be protected by copyright or donor agreements. Executive Order 13526 directs originating agencies to declassify documents if possible before shipment to NARA for long-term storage,  but NARA also stores some classified documents until they can be declassified. Its Information Security Oversight Office monitors and sets policy for the U.S. government's security classification system. On June 18, 2009, the National Archives announced the launching of a YouTube channel "to showcase popular archived films, inform the public about upcoming events around the country, and bring National Archives exhibits to the people." Also in 2009, the National Archives launched a Flickr photostream to share portions of its photographic holdings with the general public. A new teaching-with-documents Web site premiered in 2010 and was developed by the education team. The site  features 3,000 documents, images, and recordings from the holdings of the Archives. It also features lesson plans and tools for creating new classroom activities and lessons. In 1987, Charles Merrill Mount was arrested and sentenced to five years in prison for stealing 400 documents from the National Archives  . In 2002, Shawn Aubitz pleaded guilty to stealing dozens of documents and photographs from the National Archives during the 90's  . Freedom of information in the United States results from freedom of information legislation at the federal level and in the fifty states. The "thirty-year rule" is the informal name given to laws in the United Kingdom, the Republic of Ireland, and the Commonwealth of Australia that provide that certain government documents will be released publicly thirty years after they were created. Other countries' national archives also adhere to a thirty-year rule for the release of government documents. In the United States, the presidential library system is a nationwide network of 13 libraries administered by the Office of Presidential Libraries, which is part of the National Archives and Records Administration (NARA). These are repositories for preserving and making available the papers, records, collections and other historical materials of every President of the United States from Herbert Hoover to George W. Bush. In addition to the library services, museum exhibitions concerning the presidency are displayed. The Nazi War Crimes and Japanese Imperial Government Records Interagency Working Group is a United States government interagency group, which tasked with locating, identifying, inventorying, and recommending for declassification classified U.S. records relating to Nazi and Japanese war crimes. Public records are documents or pieces of information that are not considered confidential and generally pertain to the conduct of government. The Information Security Oversight Office (ISOO) is responsible to the President for policy and oversight of the government-wide security classification system and the National Industrial Security Program in the United States. The ISOO is a component of the National Archives and Records Administration (NARA) and receives policy and program guidance from the National Security Council (NSC). 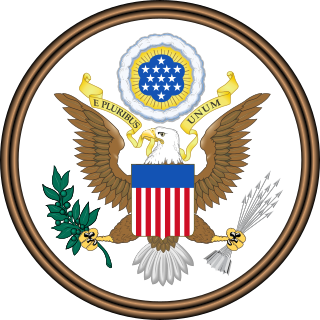 The United States government classification system is established under Executive Order 13526, the latest in a long series of executive orders on the topic. Issued by President Barack Obama in 2009, Executive Order 13526 replaced earlier executive orders on the topic and modified the regulations codified to 32 C.F.R. 2001. It lays out the system of classification, declassification, and handling of national security information generated by the U.S. government and its employees and contractors, as well as information received from other governments. The President John F. Kennedy Assassination Records Collection Act of 1992, or the JFK Records Act, is a public law passed by the United States Congress, effective October 26, 1992. It directed the National Archives and Records Administration (NARA) to establish a collection of records to be known as the President John F. Kennedy Assassination Records Collection. It stated that the collection shall consist of copies of all U.S. government records relating to the 1963 assassination of President John F. Kennedy, and that they are to be housed in the NARA Archives II building in College Park, Maryland. The collection also included any materials created or made available for use by, obtained by, or otherwise came into the possession of any state or local law enforcement office that provided support or assistance or performed work in connection with a federal inquiry into the assassination. The Joint Staff Information Management Division (IMD) is one of two divisions which make up the Joint Staff Secretariat (SJS) of the United States Joint Chiefs of Staff currently located in the Pentagon in Arlington, Virginia (USA). The other division is called Actions Division (AD) which manages the daily workflow of the staff. Archival research is a type of research which involves seeking out and extracting evidence from archival records. These records may be held either in collecting institutions, such as libraries and museums, or in the custody of the organization that originally generated or accumulated them, or in that of a successor body. Archival research can be contrasted with (1) secondary research, which involves identifying and consulting secondary sources relating to the topic of enquiry; and (2) with other types of primary research and empirical investigation such as fieldwork and experiment. Theodore Roosevelt Schellenberg was an American archivist and archival theorist. Schellenberg's publications and ideas are part of the foundation for archival theory and practice in the United States. In particular, Schellenberg is known for pioneering American archival ideas about appraisal. The FOIA Oversight and Implementation Act of 2014 is a bill that would amend the Freedom of Information Act in order to make it easier and faster to request and receive information. The bill would require the Office of Management and Budget to create a single FOIA website for people to use to make FOIA requests and check on the status of their request. The bill would also create a Chief FOIA Officers Council charged with reviewing compliance and recommending improvements. This bill would also require the federal agency to release the information it disclosed to the person who requested it publicly afterwards. 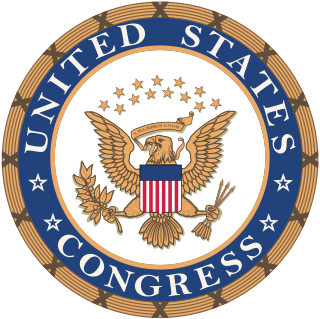 The Presidential and Federal Records Act Amendments of 2014 is a United States federal statute which amended the Presidential Records Act and Federal Records Act. Introduced as H.R. 1233, it was signed into law by President Barack Obama on November 26, 2014. The Washington National Records Center (WNRC) in Suitland, Maryland, stores and references records of U.S. Federal agencies located in the District of Columbia, Maryland, Virginia and West Virginia. Claudine Jackson Weiher served as Acting Deputy Archivist of the United States from 1986 to 1987 and Deputy Archivist of the United States from 1988 to 1993. 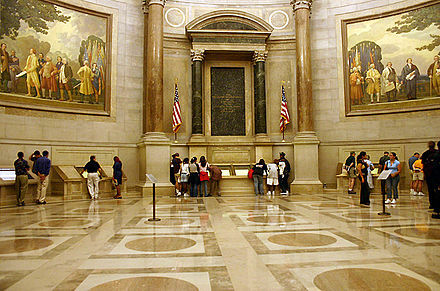 In the United States, the National Archives facilities are facilities and buildings housing the research and agency services of the country's National Archives and Records Administration. Within the organization of the National Archives, the upkeep of its facilities falls under the National Archives Facilities and Property Management Office. The organization of the National Archives and Records Administration refers to the administrative and bureaucratic structure of the National Archives and Records Administration of the United States. The National Archives is considered an independent federal government agency, receiving this status in 1985 after existing under the General Services Administration since the National Archives' founding in 1934. ↑ "Archival Milestones". National Archives and Records Administration. Retrieved March 31, 2011. ↑ "U.S. National Archives and Records Administration Fiscal Year 2014–2018 Strategic Plan" (PDF). National Archives. March 2014. p. 18. Retrieved May 10, 2017. ↑ "David Ferriero Confirmed by U.S. Senate as 10th Archivist of the United States" (Press release). National Archives and Records Administration. November 6, 2008. Retrieved November 10, 2009. ↑ "Meet our Senior Staff". archives.gov. National Archives and Records Administration. Retrieved August 23, 2011. ↑ "Secret Agreement Reveals Covert Program to Hide Reclassification from Public". National Security Archive. April 11, 2006. Retrieved March 31, 2011. ↑ Scott Shane (April 27, 2006). "National Archives Says Records Were Wrongly Classified". ↑ "National Archives and Declassification". Archives.gov. October 19, 2011. Retrieved April 29, 2013. ↑ Peet, Lisa. "NARA Responds to Controversial ICE Records Destruction Request". The Library Journal. Retrieved 2019-04-19. ↑ NARA. "The National Archives Catalog" . Retrieved May 6, 2016. ↑ NARA. "Open Government at the National Archives" . Retrieved December 13, 2012. 1 2 NARA. "About Archival Research Catalog (ARC)" . Retrieved December 13, 2012. ↑ "Copyright, Permissions and Restrictions Notice". archives.gov. Retrieved March 31, 2011. ↑ Faye Fiore (August 8, 2010). "Guardians of the nation's attic". Los Angeles Times. ↑ "National Archives and Google Launch Pilot Project to Digitize and Offer Historic Films Online" (Press release). archives.gov. 24 February 2006. Retrieved March 31, 2011. ↑ "footnote.com". footnote.com. Retrieved November 23, 2011. ↑ "National Archives and Footnote Launch Project to Digitize Historic Documents" (Press release). archives.gov. January 10, 2007. Retrieved March 31, 2011. ↑ "Thousands of National Archives Films to Be Made Available Through CustomFlix Labs" (Press release). archives.gov. July 27, 2007. Retrieved March 31, 2011. ↑ "National Archives Announces Digitizing Agreement with The Generations Network" (Press release). archives.gov. May 20, 2008. Retrieved March 17, 2015. ↑ "NARA The Generations Network Digitization Agreement" (PDF). archives.gov. ↑ "Social Media and Web 2.0 at the National Archives" . Retrieved March 31, 2011. ↑ "National Archives Launches YouTube Channel" (Press release). archives.gov. June 18, 2009. Retrieved March 31, 2011. ↑ "National Archives Photos on Flickr: FAQs" . Retrieved March 31, 2011. ↑ Churchville, V., & Saperstein, S. (1987, August 16). THE FALL FROM GRACE OF AN ARTIST, AUTHOR. The Washington Post. ↑ "Man Admits Theft From U.S. Archives". Los Angeles Times. 2002-03-14. ISSN 0458-3035 . Retrieved 2019-04-19. ↑ Carol D. Leonnig. Archives Thief Gets Two Years, The Washington Post, May 27, 2005. ↑ Eve Conant. To Catch a Thief at the National Archives, Newsweek, May 4, 2007. ↑ Panzino, Charlsy (2018-01-12). "Historian pleads guilty to stealing dog tags, military records from National Archives". Army Times. Retrieved 2019-04-19. Beschloss, Michael (2006). Our Documents: 100 Milestone Documents from the National Archives. New York: Oxford University Press. ISBN 978-0-19-530959-1 . Retrieved July 18, 2014. "Sixty-Ton Statue is Carved from a Single Slab of Stone". Popular Mechanics . 64 (2): 256. August 1935. The statue Gladiator commissioned for the main national archive building in Washington DC in 1935. "Ten-Ton Door Made of Bronze is Thirty Five Feet High". Popular Mechanics . 62 (4): 519. October 1934. This article incorporates public domain material from websites or documents ofthe National Archives and Records Administration .